A small window box planter takes on unexpected grandeur when filled with rich, velvety purples and pinks, and placed in a stylish setting. 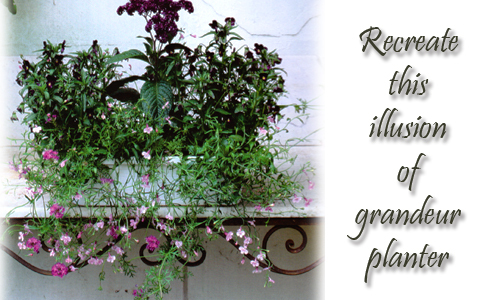 You need a 12" garden pot, heliptrope, 2 - Violas, 4 - lobelias, compost and slow release plant food granules. Step 1. Check the drainage holes are open in the base and if not, drill them or punch them out. You need good drainage in this planter. Most of the containers we sell at Arizona Pottery have drain holes but just make sure if you are using your own. Fill with compost, mixing in a teaspoon of slow release plant food granules. Plant the heliotrope in the center at the back. Step 2. Plant the violas at either end of the garden planter in the back corners. 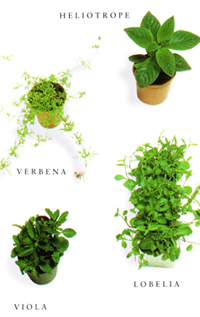 Plant the verbena centrally in front of the heliptrope. Step 3. Plant two of the lobelias on either side of the verbena and the others between the heliptrope and the violas. Water throughly and place in partial shade. Be sure to dead-head the violas regularly to keep them flowering, and pinch out any straggly stems. Best to plant in Spring. Use garden gloves to protect your hands or a garden trowel to aid in the dirt digging. This design is easy to do and beautiful once blooming but it will not last past one season so make sure you place it where it can be enjoyed. Read more.....Potted Sunflower plants give energy! Read more.....How to divide plants.